If you want durability, go with this item. If you are looking for good texture (smooth feeling) check these Exercise Balls. It is a lightweight exercise ball. SOme customer complains that it doesn’t retain as much as others. Balls is quite sticky, and may attract fur and dirt. Pump is also difficult to use, it takes quite a long time to use. The measured plastic guide to width though is a nice addition and a lot easier to use to check the ball’s width than string and a measuring tape. The 65cm ball is the ideal size for most adults and the product claims to have a burst rating of over one thousand pounds. I have used mine for a variety of both strength and balance activities and it gives me the perfect amount of support. If you’ve never purchased an exercise ball before, there are a few considerations. This is not the easiest thing to fill with the included manual pump but it actually compares quite favorably to others I have struggled with. The ball also has a slightly oily texture that is fairly natural as well, it tells you how to clean it simply enough. And there is also a recommended resting period after inflating. While these three things might sound like drawbacks, they are pretty standard. The texture of this ball is not very smooth. its a mix of sticky and slimy that we can really only describe as ‘oogie’. But its “oogie” for a reason, so that you dont slip on this ball when you are sweaty. The inflation process takes a grip of time and a firm grip. Getting it to the right dimensions does take some work. But once you’re done with that, it’s smooth sailing from there. In the instruction manual it says to rest 24 hours at 80% inflated (although good luck figuring out what 80% inflated looks like). Some customers has reported that their SKLZ has wrinkles from packaging that do not go away. 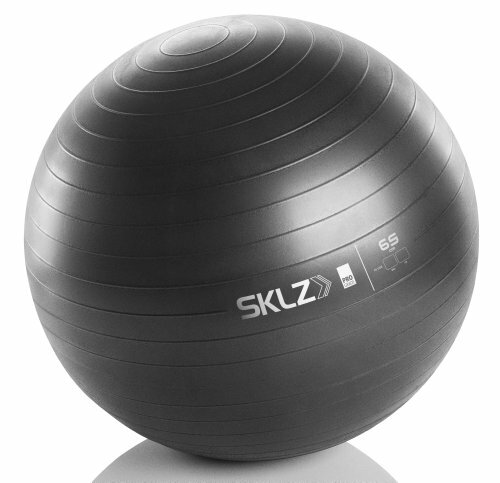 The SKLZ 65 CM ball can handle even the largest and most heavy work outs. I generally use the ball as a vehicle for abdominal workouts and elevated push ups. It’s great for both of those and solid for curls and general stability exercises. It is heavy duty and doesn’t feel like it’s going to pop if you do a little bounce on it. It gives tension back to any push. It fills all the requirements of an exercise ball, which aren’t all that numerous or complicated, but the quality of materials and construction makes a big difference in the ease of use and comfort factor. All in all, we would recommend this exercise ball, with the above caveats. The texture is oogie, and if you plan to use it regularly, you probably will have to re-inflate it from time to time, But it will survived longer than anything else inflatable, so if you want durable, definitely go with this.